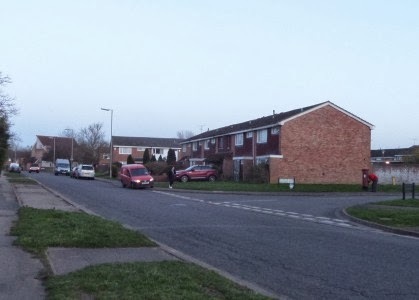 The three roads that connect the Drayton Road with Wilsham Road in South Abingdon all have traffic calming measures. Caldecott Road has speed bumps. Saxton Road has a 20 MPH Home zone with narrowing and chicanes. 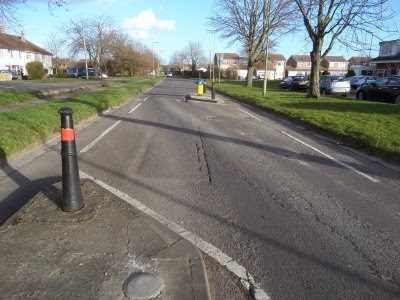 Preston Road has the notorious chicanes at the top end where drivers leave a trail as their wheels cut up the road. Some cars even bump into the chicanes. 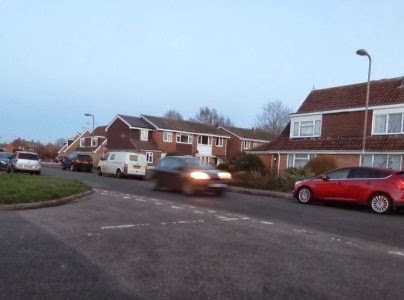 Then there is a long stretch down Preston Road where junctions are mixed with parked cars – where vehicles can go fast. So what would work best? b) More traffic calming, speed bumps, chicanes etc..
And where is that most needed? Alas, the passenger service from Abingdon was closed in 1963 and when, in 1983, the MG car factory was closed, the station and railway line, that had sat there since 1856, went with it to be replaced by an old peoples home, a supermarket and a bus service. 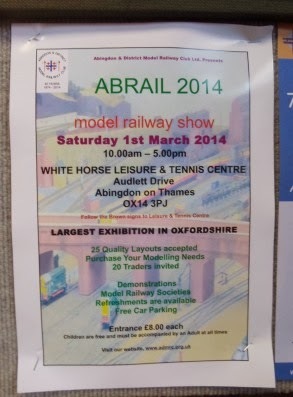 So Nicola Blackwood, MP for Oxford West and Abingdon, will have to be content with reviewing much smaller trains when she opens the Abingdon Model Railway Show. 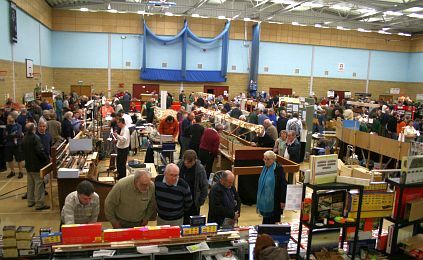 The show, staffed by a team of 170 drawn from the whole of the south of England, will bring together 25 working layouts, 20 retail trader outlets plus Club and Society stands and demonstrations to provide a veritable modelling extravaganza. 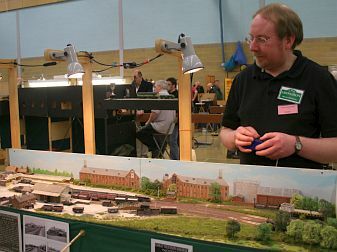 The 38th annual Abingdon Model Railway Show is the largest model railway exhibition in Oxfordshire, and is on Saturday, 1st March at the White Horse Tennis and Leisure Centre, Audlett Drive, Abingdon. Entrance price is £8.00 per adult and accompanied children under 16 are free. See admrc.org.uk for more details. Passing Larkmead School at the weekend I was impressed by their logo and motto. Caldecott Primary School – Happy Learners, Aiming High. Carswell Community Primary School – Happy Together, learning for Life. Dunmore Primary School – Great to be Inspired, Inspired to be Great. Fitzharrys School – Together Everyone Achieves. John Mason School – Excellence Through Creativity. 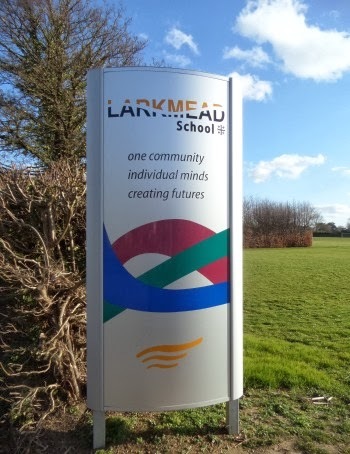 Larkmead School – One Community, Individual Minds, Creating Futures. Our Lady’s Abingdon – Altogether a better education. St Edmund’s Catholic Pimary School – In our school every day we learn, love and pray. St Nicholas CofE Primary School – Learning Excellence. 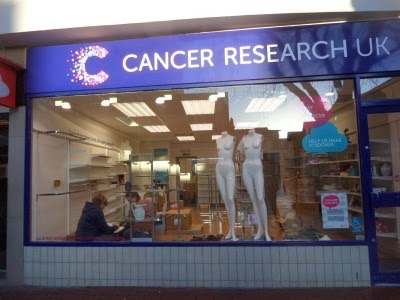 The Cancer Research UK shop in Bury Street have been having a repaint, and a refit. 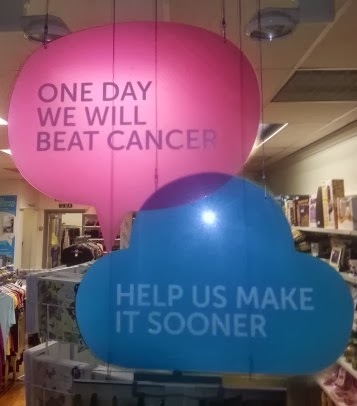 The shop is 20 years old now and is well supported by shoppers and donors alike. The shop re-opened this morning. 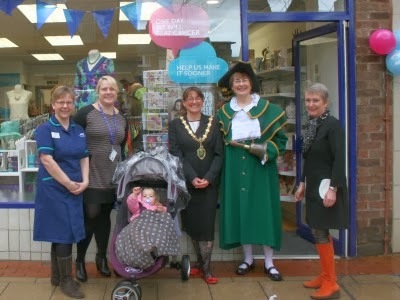 There to re-open the shop were two specialist nurses, the Mayor and her baby daughter, and Penny Clover, one of the Abingdon town criers, and Clare who sent me an email letting me know about the refit. P.S. Dedicated to all those for whom it won’t be soon enough. 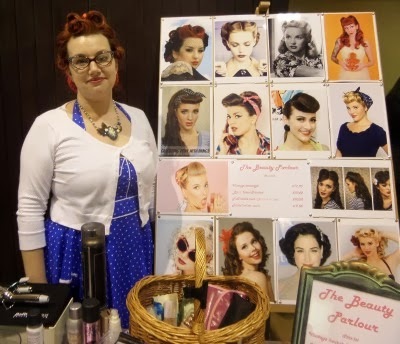 Ruby’s Vintage & Retro Fair was back at the Guildhall yesterday. There was a lady doing retro hair styling. There was also lots of retro clothes for the ladies, fewer for the men – most that had stood the test of time. 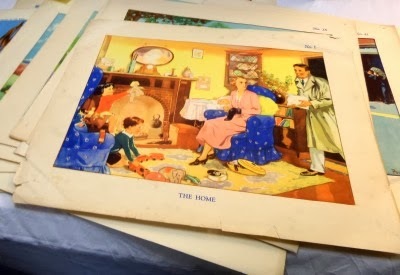 Old schoolroom posters were on sale. The attraction of retro fairs is that we can see and buy objects that remind us of younger days, whether that be the 50s, 60s, 70s, or 80s. 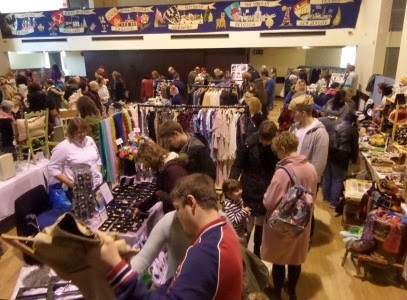 The retro fair will be back twice more in 2014.